In this Blog, I am sharing my Experience , How i have cleared the 70-533 -Implementing Microsoft Azure Infrastructure Solutions Exam. As i have been spoken and received an massage from my couple of followers requesting to share the tips and Tricks on how i have passed on 70-735 exam.Hence sharing the thoughts on this. I have seen many people who has fear of Exam whether i will pass or not ,as been not giving any exam from 3 to 4 years or some other reason which is really common scenario , Hence We have to fight with our fear and take an step towards our carrier /Certification which might play an important role in carrier and justify our expertise . The first part i did it , Removed the fear from my mind and thought it’s just an normal or my 10th Board Exam and which i have to clear any how. Before appearing to any exam, I will preparing the course content related to exam which help to understand , What are the challenges i am going to face during the preparation and what are possible scenarios may come to 70-533 Exam. Few Things Which i majorly Focus on this training. List out the Each and every section and more focus on the part where you will get 15 to 35 % Question from Modules as per course content. Then rest of other modules which i have covered as per course content . How Do i Prepare for Exam ? There are various way to prepare the exam. 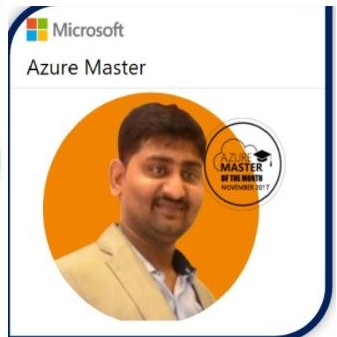 If you wants you can go through our Azure Talk session which will really help of clearing the exam and help you to understand Azure Component. It’s help Many Azure training and Pass the exam. I have prepared from the below Online Training Sites which will help you to pass the exam. Even you can register for free trail and get trained for exam preparation. Do More Lab and Labs which is very Important Part. Even you would like to have more labs you can follow my other Blogs where i have covers most 70-533 related topics which will help you to understand easily. How to Attend the 70-533 Exam. Note: Below are the suggestion is Related to my real experience which i have observers, Followers or Reader may not get same Scenario it may differs as per Microsoft Exam Policy. When i was attending an exam, I am well prepared and trained with No fear and have confident to clear the exam. Before you start the exam , Please have few point in minds. Once you will click on start exam ,One window will appear , Please go through it you might have 10 mints to read the instruction before the Exam Start. Once you will done with Instruction part , Main question will be appear . In my Case i got few Optional Question Where we have answer those question without moving to next question, if you moved then you won’t come to previous question. Second Part you will get All the Scenarios Based Question and i would suggest ,Please read carefully and answer you question and In this section we have couple of option. In Left hand side you will get an option for time window. Middle you will get 4 option or you need to match the answer while drag and drop. Review : IF you are not sure that answer is correct , Please click on review if you wont click on the review then you won’t be able modify your answer and might your answer will locked. Next: IF you are sure that answer is correct , Please click next and your answer will locked. Submit : If you are sure that you answer is correct then Please click on submit the answer . All the Suggestion and ideas is based on my experience which i want to share with my followers. Please do like , Share , Subscribe ….